The problem is the corporate profits data to which he refers includes millions of businesses that are not subject to the corporate tax, namely S corporations that are taxed under the individual tax code instead. See the BEA definition of corporate profits here. This is not a minor mistake. S corporation profits are almost as large as C corporation profits, but, again, only C corporations are subject to the corporate tax. See the chart below. It just makes no sense to compare C corporation taxes with C plus S corporation profits. 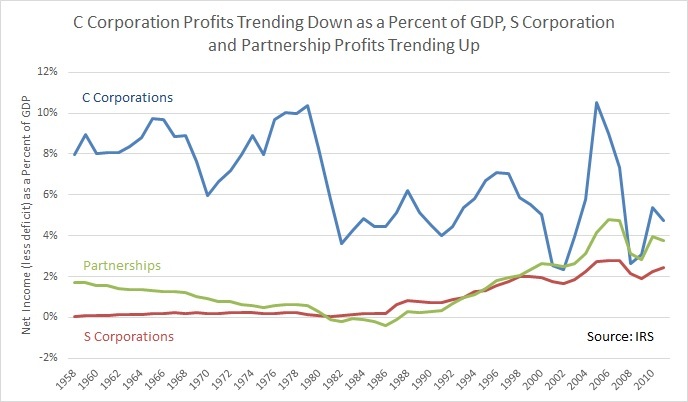 The second chart reveals the real reason why corporate tax revenue has fallen as a share of GDP over the last few decades: corporate profits have fallen, i.e. profits of C corporations to which the corporate tax applies. The U.S. corporate tax regime itself has remained essentially the same since 1986, but C corporations have fled the tax code at the rate of about 50,000 a year. Some of them reformed as S corporations, or other pass-through businesses taxed under the individual code. Some of them inverted to lower tax countries. Others simply went out of business and never came back, and the new entrepreneurs steered clear of America’s overly burdensome corporate sector. America’s extremely uncompetitive corporate tax hobbles American corporations, and corporations perform economic functions that cannot be done by smaller businesses, such as build airplanes. That means jobs are lost and wage growth stagnates. Obscuring these facts is unfair to American workers.